February started out on a pretty life changing note. A day after I got “the call“, I went to bible study, which I don’t regularly go like I should. The lesson for the night was teaching from the book of Daniel, and discussed Daniel’s fast and what brought him to do this. You can read the whole 1st chapter of Daniel, but the main part of the story is found in Daniel 1:8-17. To sum up, Daniel and his three buddies were among servants to the king and had been given the best foods and wines that the king appointed for them. Daniel and Co. didn’t want to defile themselves with king’s food, so he asked for just vegetables and water, and after 10 days, compare how they look to the rest of the servants who had been eating the king’s food. (The king wasn’t the greatest guy in the world, although I’m sure his food was awesome, but Daniel didn’t want any part of it.) At the end of the 10 days, Daniel and his buddies were compared to the rest of the servants and they had looked better than the rest of them. God also blessed them with intelligence and wisdom and for Daniel, the ability to interpret dreams and visions. I’ve always had an interest in dream interpretation, by the way. I have several books to help with such things. But I’d love to be at the point that I don’t always need to consult them, but that’ll take time and studying. Anyway, I’ve always been taught that some things you pray for won’t come without fasting. Sometimes you also just need to do something different than your usual praying routine or fast to show God you’re serious about what you’re asking for. And I’ve been on fasts before: mostly not eating for an appointed time, but nothing like the Daniel fast. And this was the perfect time to do it. I just got laid off the day before I went to this particular bible study. While some people might panic or be upset about losing their job, I was actually at peace realizing that this is probably a sign from God that something better must be coming. Proof was all around me of how blessed I had been, so I couldn’t imagine what was next. But now that I was free from that job, what was I supposed to do next? I needed direction. I needed guidance. And I needed to do something different. Seriously. So a week later I decided to embark on the Daniel Fast. At first, I thought it was nothing but veggies and water until I did some research. Not only was the Daniel fast 21 days, but the food list was a bit different than I imagined. Things like bread weren’t allowed. I admit, there were probably a few things on the list of can-eats that I didn’t eat and a few on the don’t eat that I may have eaten, but overall, I took it pretty seriously. One thing I did that is in somewhat allowed was drink apple cider as a breakfast meal. I didn’t do it every morning, and the cider I bought was nothing but apples and water, no extra additives or anything. Oh, and fruit was allowed as long as it wasn’t processed. And I may have eaten more peanuts than I ever did in my life. Let this be clear, even though it’s a healthy way to eat, this was not a diet! I was not doing this to lose weight although I’m sure I did. So what did my daily menu look like? DAY 1 (Friday) — My parents ordered out, and I got a garden salad with oil and vinegar. I didn’t like it and ended up still very hungry. So I got some leftover string beans and corn. I was still hungry so I made myself a big bowl of peas and ate those the rest of the night. DAY 2 (Saturday) — I started the morning with a frozen string beans. Later I went to the store and bought a fresh bag of romaine, all natural olive oil salad dressing, a bag of peanuts, a can of tomato soup and baby carrots. I just had a salad with the dressing followed with some peanuts as a snack. I later had a fruit cup. DAY 3 (Sunday) — My family had dinner at my grandmother’s house. Sadly I could not partake of the delicious looking chicken and buttery biscuits. They also stopped by KFC (which I wouldn’t have eaten anyway) but they got my some side orders of corn and string beans. My grandmother also made corn, along with mashed potatoes and broccoli. I had the KFC veggies after, which tasted old and gross. I went home and had more peanuts and another fruit cup. DAY 4 (Monday) — I was in the mood for some crispy potatoes… and baked several. 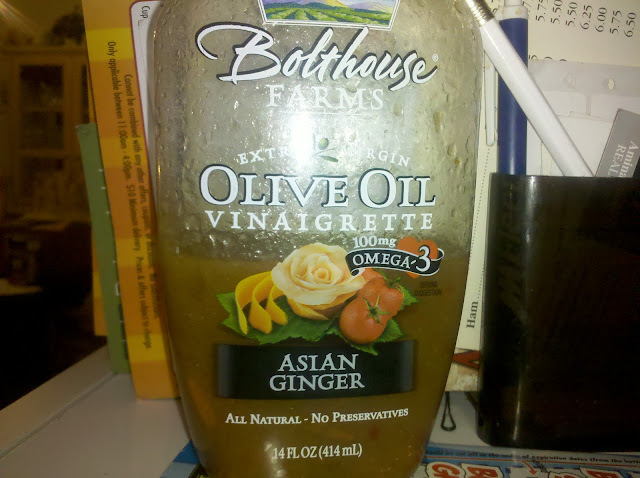 I experimented with both oil and butter (which technically I wasn’t supposed to be using, belonging to the dairy family.) After filling up on potatoes, I had more peanuts to snack on. DAY 5 (Tuesday) — I had volunteered to drive my grandmother and her siblings to NYC to visit one of her sisters. I felt this would be fairly easy since I wouldn’t be in the house surrounded by food… until they stopped at McDonald’s. I don’t eat their food either, but that day it smelled heavenly. My uncle made that fish sandwich look like it was the best food on the planet. I nursed my bottle of water until they finished and the smell left the vehicle. I longed for coffee the drive home when I felt like I was dozing at the wheel. Two hours later I come home to spaghetti and meatballs in the kitchen. I instead chow down on broccoli and then celery and carrots with peanut butter. DAY 6 (Wednesday) — I went back to the store with a craving for collard greens. I picked up a couple cans and when I got home, downed one of them before bible study. When I got back home, I cooked a chicken dinner for my parents (easier to do than I thought) and made broccoli for myself along with the tomato soup. DAY 7 (Thursday) — I awoke to stomach pains, but assumed it was gas… that never really went away whenever I was laying down. I had a fruit cup in the morning before later having more salad for dinner. I needed a snack and I was sick of peanuts so I boiled carrots like my mom does. They didn’t taste like hers, but she loved them and ate the rest because I didn’t like them. 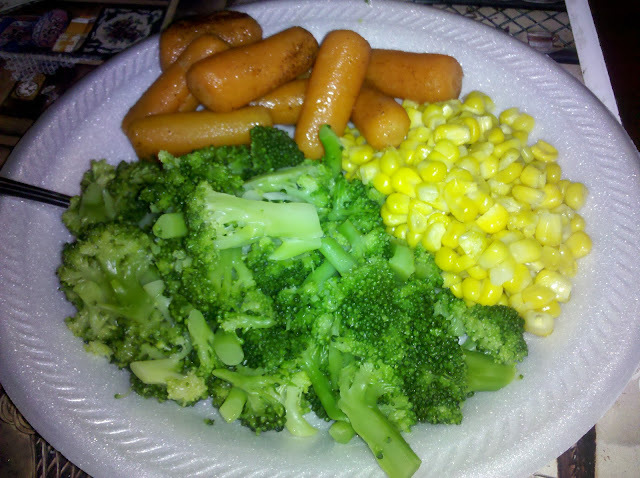 DAY 8 (Friday) — My mother made dinner for me, reheating the broccoli I made before, making some fresh delicious corn, and made the carrots I love. A very colorful meal. Meanwhile, I made them steak. Also wasn’t too hard to do. DAY 9 (Saturday) — My mom once again prepared dinner for me, making my other can of collard greens, more corn and the rest of my carrots. I spent the day watching movies and drinking water. DAY 10 (Sunday) — My family and I agreed that I should end my fast on the 10th day as opposed to after the 10th day. After church, my sister treated the family to a hibachi dinner, and it seemed appropriate to end my fast that day. Earlier that morning, however, I had the worst pains ever in my stomach. My dad had them too and told me to take some Pepto Bismal. We determined it was the collard greens, we were the only ones who ate them. But by dinner time, we were feeling much better, and after dinner, we were ready for a good nap. Also on Sunday, it was just a great day in church. I felt as though I passed a really difficult test and this was part of the celebration. A lot of people admired me for doing it and are inspired to do something similar. I’m proud of myself for completing it too, but I couldn’t do it without God’s help and with lots of prayer. As for results… well so far I was guided to the Connecticut School of Broadcasting on Monday, took a tour on Tuesday, and got accepted in the program on Wednesday. I didn’t expect an answer so soon, but there ya go. As I always say when something miraculous happens: you can call it coincidence if you want to, but I know an act of God when I see one. As for the lesson learned here, if you want an answer from God, you have to trust he’ll answer it and wait for the answer. There’s a lot more that goes to that, but that’s the short answer. Sure, it was a healthy diet, but I missed my meats, my snacks, my cookies! It was a big sacrifice for a big cause. I feel as though God heard my plea and gave me my answer. And now that I’ve survived this, I think I can handle the real Daniel fast. But I’m not in a hurry to do that just yet. How ironic that this would come up on your blog at this time! though I’m sure it’s one of those “God things” and not an accident! I actually just went through a thing with a church- actually with a specific group in the church. I think you know I’ve been between churches in the past few months, and lately I’ve been going to a particular (large-ish) church that I like- the senior pastor is a very gifted speaker. Long story short, I discovered that the church’s singles group was pushing a weeklong “daniel fast”- except in their version of it, you were supposed to eat nothing but veggies and water. Literally, if you can’t grow it in your backyard garden, don’t eat it. Furthermore this was not planned at all- the singles pastor just woke up and decided that “this week we should fast”. Irritating. Not because I’m opposed to fasting- quite the opposite- but I’m bothered by the lack of planning, and also I think corporate fasting is something that should be handled very carefully. When you’ve got a group of 75 or 100 people, and “guess what, we’re all gonna fast”, I would fear that someone will fast due to peer pressure, not a desire to grow closer to God, get answers to prayer, etc. Also with that many people, statistically you have to assume that some of them are going to have medical conditions affecting their ability to fast, like diabetes, eating disorders, etc. I do think fasting as a whole is really great, though. I mean of course don’t start fasting if you have medical conditions that preclude it, but fasting in all forms is valuable- even if it’s a non-food fast like your cellphone, your mp3 player, the Internet, etc. But the food fasts are probably the most powerful. I really respect this- I know I would have struggled with some of those choices! Congratulations on getting accepted to the broadcasting school! I am looking forward to hearing your stories in this new chapter of your life!! I agree, a fast like this should be planned out, especially if you’re going to be on it for more than few days. I went shopping the day before and even had my last few meaty meals. But basically, I had been thinking about doing it for a week, and it was only me. 75-100 people out of nowhere? That’s a bit much. And yes, fasting can be much more than just turning down food and I’ve gone on those kinds of fasts before. I even went on a Facebook fast, but that was more of a test if I could do without it. But this fast was the most challenging, most difficult, yet most rewarding thing I’ve done and I’m already seeing the changes since it ended. Truth be told, things were happening even while I was on it. So I hope and pray you get blessed like I did if not something greater when you’re done. Are you or have you blogged about it? I have to check it out. I’ve been slacking a lot lately on reading. The “long story short” part was that I was told about this fast on just my second visit to the singles group (and my first visit had been some 3wks prior). I wasn’t really given an option- more like I was told to do it. At first I assumed this was something they had been planning for a long time (as you said, a fast should be planned out), but I figured out over the next week and a half or so that it was not planned at all. Very bothersome, on many many levels. As a friend of mine said, their enthusiasm for fasting was excellent but they clearly had not thought through the entire process. I am one of those people with medical conditions that preclude fasting (email me melindaATmelindamusilDOTcom and I’ll explain it a little more if you want) so I didn’t fast- or at least no strict food fasts. Honestly I probably *could* do a food fast but I would have to research it and check with my doctor- not something I can do last minute like this. I actually decided that I will be leaving this group- I haven’t given up on this church, and it’s large enough that there are numerous groups within it, but I won’t return to this particular group. I’m getting a very big sense that this group is surprisingly disorganized- surprising because the rest of the church seems to be VERY organized- and very lacking in communication. I really want you to thank to your period of this fantastic examine! won a race in Kansas. Of note, Jimmie Johnson has won the race twice, in 2003 and 2006, as has Mark Martin (1998, 2005). Well the date of the event is Sunday, February 26th, while the start time is scheduled for 12 p.